I wonder how many Christians will be apologizing to Thomas in heaven. He inherited quite a reputation as a doubter. In my opinion, “Doubting Thomas” got a bad rap. He’s not even called by that nickname in scripture. And I don’t want to be among those who trash his name. Maybe it’s because I am a lot like Thomas. If I were in Thomas’s position, being told they talked with Jesus, after I saw him crucified, I probably would have reacted the same way. Someone else’s experience is not enough for me. I want my own signature moments with God. The faith journey is a test of endurance. We come to a life of faith with nothing…but faith. And faith alone is enough. But at some point, your faith needs some substance. And I’m not talking about substance from you. I’m talking about substance from God. That’s right – when our faith is tested, we need God to step up! What I mean is, God offers proof for those who want it. He offers further assurance for those who need a boost for their faith. Throughout scripture, faith heroes called out to God for “more.” Gideon wanted proof that His angel encounter was for real; God gave Him the proof he wanted (multiple times actually). Moses wanted proof that God was pleased with Him; God gave Him a special encounter on the mountain. And Thomas wanted something more too. After all, he was a personal friend, a disciple, to Jesus. He wanted more than just a second hand account of Jesus’ aliveness. Seasons of doubt are to be expected. Life on earth is long. And our faith… gets tired. God knows we need faith boosters along the way. After all, He’s a good Father, right? Jesus knew that Thomas needed his own moment with God. When Jesus took the hands of Thomas and placed them over his scars, Thomas encountered the fresh wounds of the risen Christ. Can you imagine that moment for Thomas – rubbing his fingers over the nail-scarred flesh of the risen God? “My Lord and my God,” Thomas cried out. Yes, he had seen God. And his unbelief was once again defeated. Often we tell the story of Thomas as one of disappointment and failure. But I see it differently. I see the privilege Thomas had of a personal revelation with God. And I see someone who had the guts to ask for more. I often have doubts about God’s involvement in certain areas of my life. It’s not that I doubt God presence or existence. But I do tend to shrink back in fear at times, and desire more assurance of the things unseen. Something tells me you have these moments too. It could be doubt about a particular call on your life – maybe I don’t belong here in seminary. It could be doubt about your marriage – maybe we’ll never be able to reconcile. It could be doubt about a wayward child – maybe my child has abandoned God, and maybe God has abandoned him, too. It could even be doubt at the very inner core of your faith – maybe God is not even real! If you are struggling with feelings of doubt – your first step is an honest call-out to God. “Help my unbelief!” (Mark 9:24). In the case of Thomas, he said, “Unless I see the nail marks in his hands and put my finger where the nails were, and put my hand into his side, I will not believe” (John 20:25). Sure enough, Jesus showed up and gave Thomas the proof he needed. It’s comforting to know that these God encounters are available to us. I call these encounters divine applause moments – when God connects with us in noticeable ways. Being steadfast in faith does not mean that you’ll never have weak moments. Instead it means your weak moments can be met with fresh experiences, divine applause moments to strengthen you for the journey ahead. 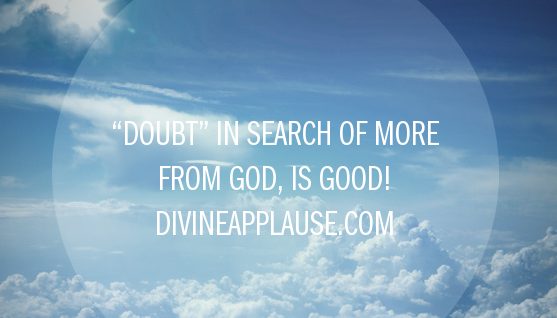 “Doubt”, in search of more from God, is good!